Rafael Nadal's loss to Czech newcomer Lukas Rosol at Wimbledon marked the superstar's earliest Grand Slam exit since 2005. 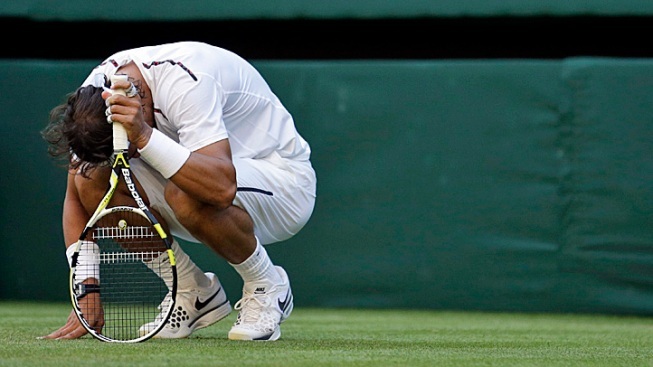 Rafael Nadal made his earliest Grand Slam exit since 2005 when he was overpowered Thursday by big-serving Lukas Rosol 6-7 (9), 6-4, 6-4, 2-6, 6-4 in the second round at Wimbledon. Rosol, a 26-year-old Czech ranked No. 100, earned the biggest win of his career playing in Wimbledon's main draw for the first time. He lost each of the past five years in the first round of qualifying. As the match stretched beyond dusk, the conclusion came with the retractable roof closed for the final set on Centre Court. The upset on tennis' biggest stage was no fluke: Rosol served brilliantly and repeatedly stepped instead the baseline to hit aggressive groundstrokes, while Nadal found himself pinned deep and on the defensive.